The warm weather didn’t last very long, did it? Every year it happens; a spell of unseasonably warm weather sends us running to the barbeque aisle wearing last year’s linen trousers, a paddling pool under one arm, under the delusion that summer has vanquished the snow, wind, snow, rain and snow. Then within a week, the jet stream talks a vicious swing south, and we’re back beneath our brollies, pointlessly cursing weather forecasters; “YOU SAID IT WOULD BE MILD CAROL KIRKWOOD!” It’s like it’s October already. You’ll forgive me for looking forward to October when we have a thoroughly underwhelming British summer to negotiate beforehand. 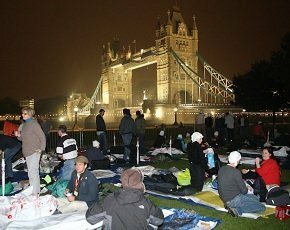 Friday 4 October will be one of the most monumental in the history of Byte Night, the UK’s largest charity sleep-out event. This year we are aiming to raise more than £1m in one night, cementing Byte Night’s position as one of the most important charity events in the UK. This will take a truly national effort and so we are launching sleep-outs in Birmingham and Manchester, alongside events in Belfast, Cambridge, Edinburgh, London and Thames Valley. Some 100,000 young people in the UK were homeless last year. One in three attempted to commit suicide. We must change this. Last year was tough. There is no getting away from it - it chucked it down. Despite this, over 1,000 people braved relentless rain to raise £950,000 for children and young people, who could face night-after-night on the streets were it not for the fantastic work of Action for Children. No doubt some walked away from last year’s event mumbling “never again”. But for the vast majority the weather last year underlined why Byte Night is so important. It forced people to face the grim reality of life on streets and, having done so, made them determined to do something about it. Some 100,000 young people in the UK were homeless last year. One in three attempted to commit suicide. We must change this. Read Ken Deek's review of last year's Byte Night charity sleep-out. By supporting Byte Night you are helping Action for Children tackle the root causes of youth homelessness, working with young people at risk across the UK, such as those leaving the care system, young people at risk of family breakdown and those who are already without a safe place to sleep. Together we can keep vulnerable young people off the streets and help them to build better lives with access to education, secure accommodation and training opportunities. Registration for this year’s event is now open and we are confident that more than 1500 sleepers will join us on Friday 4 October at events across the UK, whatever the weather. By doing so, they will help us to make a real difference to the lives of vulnerable young people across the UK. Sign up to sleep-out now at www.bytenight.org.uk . Ken Deeks is the founder of Byte Night. Since its inception in 1998, Byte Night has raised more than £5m towards Action for Children’s work providing vital help and support to vulnerable young people across the UK. Advice, budgeting skills and counselling, education and training programmes and vital accommodation are given to hundreds of young people at risk of homelessness every year.